Mac Data Recovery | Apple Data Recovery | HFS+ | Flashing Folder ? We provide the most affordable Mac Data Recovery services! Back in 2007, we were just a Mac repair company. Over the years, we’ve transitioned into the premier affordable data recovery company. But, we didn’t forget what we learned about Macs, and now we’re one of the most experienced and knowledgeable Mac data recovery companies. One of the most common signs that you need data recovery for your Mac is the “flashing folder with the question mark” when starting up. The “flashing question mark in folder” symbol means the computer can’t find the operating system folder and therefore cannot startup. Other problems include a spinning wheel (aka “the spinning wheel of death” or “colored pinwheel”) or an unresponsive operating system. The next step you take to recover your data is crucial. If you attempt to repair the drive, the problem could become far worse, including the potential for permanent data loss. Data loss is a common problem when a “repair” program (like FSCK or DiskWarrior) is run on a damaged Mac hard drive. Attempting to recover your data using software data recovery tools (like Data Rescue 3 and R-Studio) could exhaust and kill your hard drive completely due to repeatedly attempting to read bad sectors and/or areas of the hard drive which have sustained critical damaged (like a scratch on the platters). Rather than risk your data to a failed repair or botched recovery attempt, we only follow the safest and most advanced data recovery process. This includes visually inspecting your drive in our clean room, carefully diagnosing the drive’s firmware and heads, creating a full sector-by-sector clone of your hard drive, and thoroughly scanning and recovering as much data from our clone as possible. 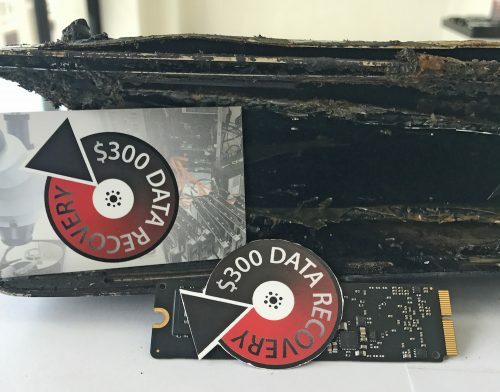 If your data is worth at least $300, we highly recommend choosing our safe data recovery approach rather than attempting to repair/recover the hard drive yourself and risking data loss or further damage. 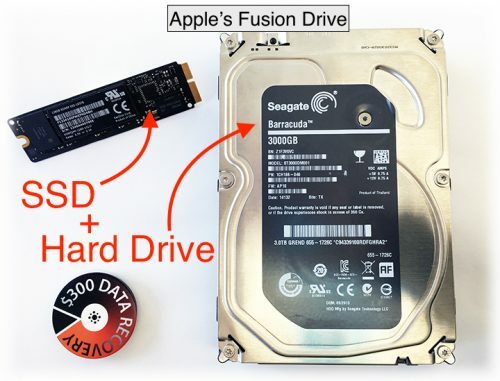 Do you have a Fusion Drive? Apple’s Fusion Drive is, in fact, Apple’s proprietary RAID format. Consisting of a fast/small SSD drive along with a slower/larger HDD drive, Fusion Drives allow you to move data quickly while yielding more space than a typical SSD could alone provide. Fusion drives are typically found in iMacs and Mac Pros — not Macbooks/Macbook Pros. The problem with Fusion Drives is when one drive fails, you lose everything (similar to a RAID-0). We have a lot of experience recovering failed Fusion Drives. If you need your Fusion Drive recovered, be sure to give us both drives (the SSD and the HDD). If only the SSD is available, then typically no data can be recovered. If only the HDD is available, often we can recover many files, but they will not have their original folder structure or file names. For Fusion Drives, just like RAIDs, we charge per drive. Most Fusion Drives have a 3TB HDD, so the total cost is $700 ($300 to recover the SSD and $400 to recover a drive over 2TB). If your HDD is 2TB or smaller, the cost is $600 total. And if your Fusion Drive is encrypted with FileVault (Apple’s encryption), the cost is +$200 ($100 “encryption fee” per drive in RAID). Our rates are $300-$500 (per drive) if we recover your data, no charge if not. This is about 300% cheaper than our competitors offering the same services. If you live in Los Angeles and would like to drop off your drive, please see our Drop Off Info page (and consider submitting our Express Drop Off Form to save around 10 minutes when dropping off). If you’d like to mail-in your drive, please see our Mail-In Info page. Have any more questions about our Mac/Apple data recovery services or capabilities? You can chat with us 24×7, send us an e-mail, or give us a call at (323) 230-0622.